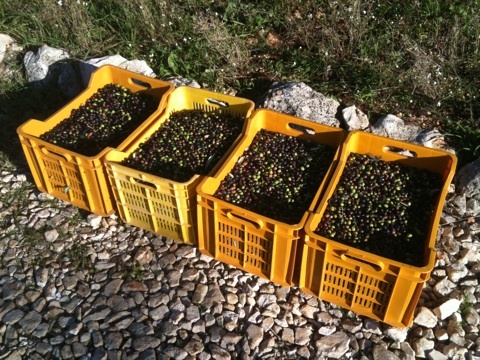 We had planned to harvest our olives two weeks ago but it was a late harvest due to the weather this year. 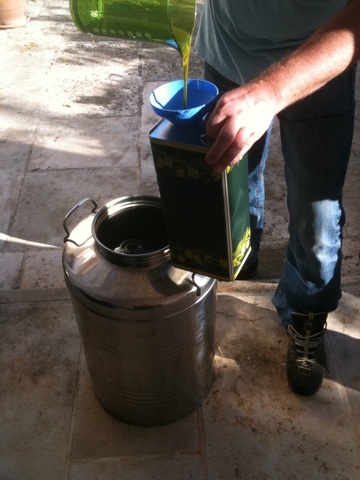 So we just had to come back again to harvest our olives and help our neighbours harvest theirs. 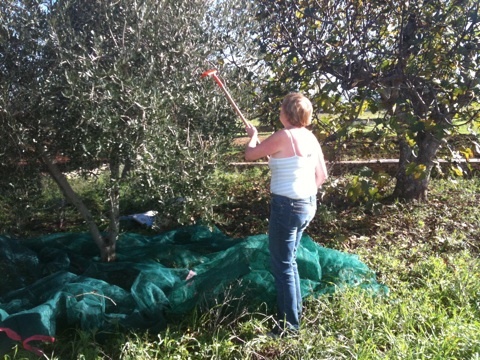 Low tech harvesting - spread nets either side of the tree and rake the olives off the branches with small claw-like rakes. Then herd the olives together by lifting the net edges and empty into crates. There was also some daredevil ladder-work to harvest the higher branches. 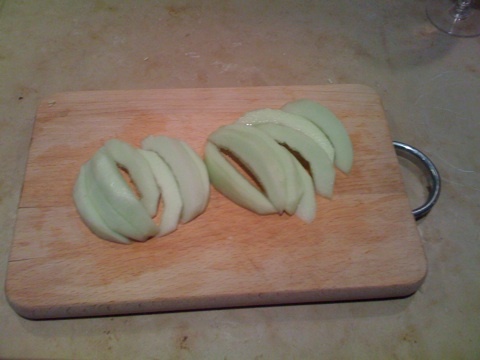 Olives are a bit like apples - crops alternate in size: one year good; the next year less good. Last year the yield was about 30 kg; this year a bumper 84 kg. The minimum pressing quantity at the local cooperative is 100kg so we tipped ours in with neighbour Mino's. He has many more trees and a bunch of his wife's relatives to help with the harvest. His yield was nearly one and a half tons! 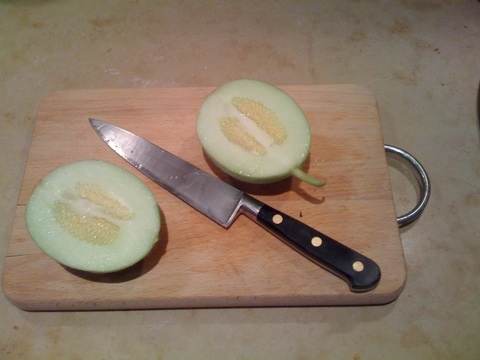 We paid a little more on the pressing fee to have ours cold-pressed - better for the flavour. 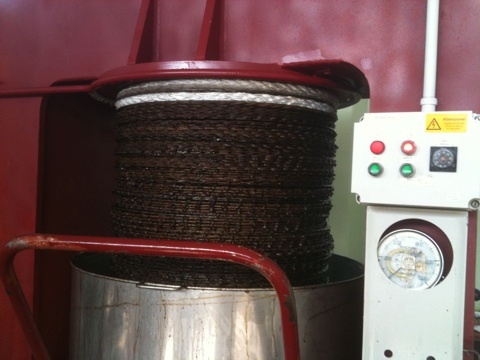 The olives are milled to a mud-like brown, gritty paste then spread on circular mats. These are then stacked and pressed under considerable pressure. Each batch is done separately so we know we and Mino get back our own oil. This month we are going to tackle a stretch of the Wandle 50m or so downstream from where we got in at our August cleanup, so between the Lydden Road bridge and the Foster's Way bridge in Earlsfield. Well-served by public transport (overground train to Earlsfield station and on the 44 and 270 bus routes), there are also plenty of railings to which you can chain bicycles and there's space to park too. Click here to see where we'll be meeting. Please arrive in time for our Health and Safety briefing at 11am. If you arrive later than that, don't worry, you'll be asked to read the briefing and sign in to confirm your understanding of the guidelines, and agreement to adhere to them. For the benefit of those of you who are new, we work in several groups, some people in the water pulling out rubbish, some wheeling or carrying the rubbish to the dump site and others litter picking along the banks/trail. We'll break for tea/coffee and cake provided by us at about 1pm and carry on afterwards until about 3pm. As we are in the borough of Wandsworth, Terry and his truck will come and collect the rubbish at the end of the cleanup, so we'd be grateful if some of you could stay behind and help load up. As always, we're extremely grateful to Joanna, Michael, and the Wandsworth Waste Management Team for their support in picking up all the rubbish. We supply a number of pairs of chest waders, but if you do have your own, please bring them. We also provide gloves and litter pickers. Tough boots, trainers or Wellingtons are recommended for anyone who wants to work on the banks. Everyone should wear old clothes that they don't mind getting dirty, and it may also be worth bringing a change of clothes, in case your waders spring a leak! You may want to bring a picnic lunch too. This year's Christmas cards, designed by Trustee Jane Porter and printed locally, will be on sale - a pack of 8 costs £10.00 so please remember to bring your hard earned cash! All profits will go directly to help the work of the Wandle Trust. See you on Sunday week. Saturday was our seventeenth wedding anniversary and we planned a triple-purpose weekend in Italy with our friends Bob and Lynn: harvest our olives, pack up Trullo Azzurro for the winter and, of course, celebrate seventeen years. 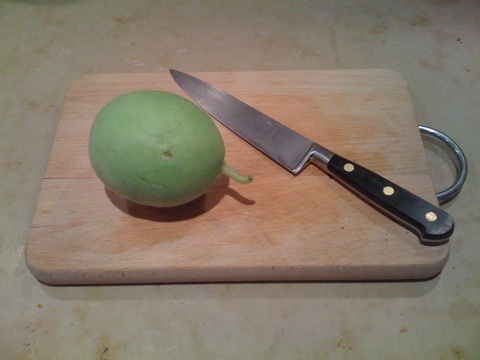 As it turned out the advice from the neighbours was wait two weeks before the olives were ripe for the picking. So we booked another set of flights for two weekend's time and went for Plan B - eating and drinking. Friday night we went straight from the airport to our neighbours Chris and John who very kindly provided a late supper and thence to bed. Saturday we did the tourist thing inspired by Bob and Lynn who had done their research. 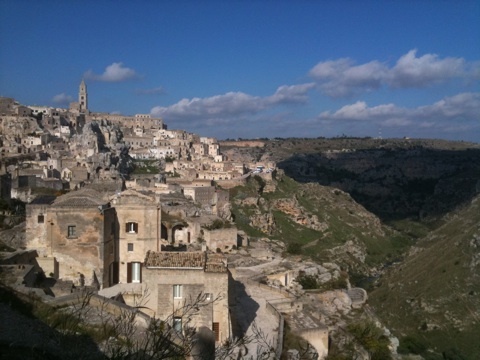 We went over the border into Basilicata to visit the fascinating city of Matera. That evening we went to our favourite posh restaurant - Osteria Sant'Anna for their antipasti della casa and assorted secondi followed by an entirely unnecessary dolce and vin santo. Sunday was a visit to La Rotonda Da Rosa, Torre Canne for a three hour lunch. After that a short drive to Torre Guaceto nature reserve for a long (two hour) walk along the coast only to discover some ********* had broken into the car and stolen Mary's handbag and our supper. Yes, they were locked away in the boot. No passports or credit cards lost but we will have to replace the locks just to be on the safe side. And we did Groundhog day shopping in the supermarket to replace the contents on the M&S cool bag for a supper at home. Monday was some preemptive bagging up of linens followed by a leisurely trip to the airport for lunch. And then we went straight from Stansted to central London for supper in The Cork and Bottle Wine Bar followed by John Mayall at the Leicester Square Theatre. Excellent concert from a legend with a fine support act from Marcus Bonfanti. That is why I go to work for a rest!